In the world of Lego – at least for those of us with autos on the brain – few creations are as fantastic as the Technic version of the Bugatti Chiron. To refresh your memory, this $350 kit utilizes no less than 3,599 pieces to faithfully recreate the French supercar in 1:8 scale. The doors open, the engine has moving pistons, and even the gearbox works. The only thing you can’t do is drive it, but as the above video shows, that was unacceptable to the folks at Donut Media. 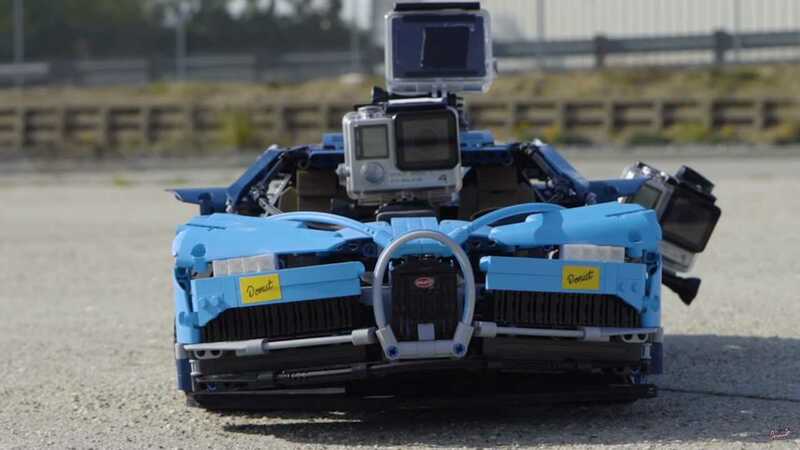 The video also proves driving a Lego Bugatti isn’t easy, but it did set a “record in its short lifespan.” More on both of these subjects in a bit. The delectable Lego Bugatti is a challenge to build by itself, but once completed, the team ventured to a local hobby store for some actual motivation. The goal was to see the 1:8 scale Chiron achieve its proper top speed of 261 mph (420 km/h) – in scale form of course. That equates to 32.6 mph (52.5 km/h) which, in the world of radio control tomfoolery is easily achievable. Here’s where a bit of cheating was involved. Rather than shoehorn an electric motor and battery pack into the complex Technic build, the hobby shop pros basically tweaked the Chiron body and dropped it onto a fully-functional electric radio-controlled chassis. This allowed for some serious power with actual steering control, and while the chassis isn’t Lego-specific, the original Technic wheels and tires were fitted for authenticity. In retrospect, perhaps something with a bit more grip should’ve been brought to the table. We say that because the bricked-out Chiron made a fabulous speed run, easily eclipsing the target speed in the process. You’ll notice we said run, as in a single run, because things sadly took a turn for the worse. At least the bonkers build went out in a blaze of glory.